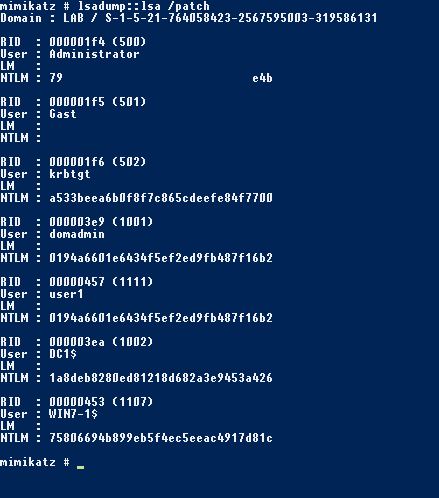 Some time ago on a lazy, snowy sunday afternoon I decided to take a deep dive into mimikatz. While browsing through the features of this fascinating tool I came across the module lsadump::lsa and just started to explore that. Since mimikatz's overall documentation is ... improvable ;) I decided to write my findings down. Maybe this helps somebody. /inject is additionally requesting PROCESS_CREATE_THREAD, which /patch does not require, since it does not start a thread inside lsass.exe. hint: these flags are a great place to start hunting using sysmon with your Blue Team). First mimikatz opens a handle on the LSA policy (LsaOpenPolicy()), using this handle it retrieves the domain information (LsaQueryInformationPolicy()). Then, for both commands, it connects to the SAM API (SamConnect()). There it opens the found domain (SamOpenDomain()). After that RID and username handles can be retrieved to limit the scope of the credential retrival as specified by the user. The next step is to retrive the credentials. 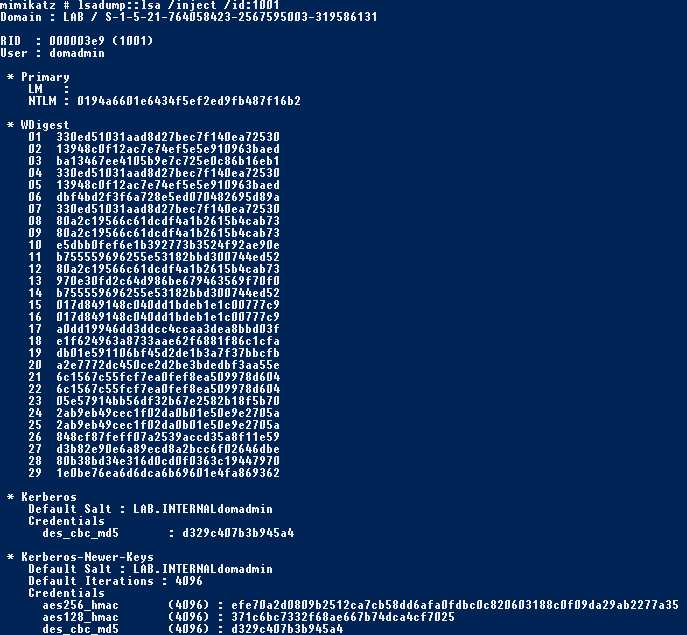 How does mimikatz do that? As the command name suggests mimikatz is patching something to dump the NTLM hashes - namely the samsrv.dll running inside the process lsass.exe. The location marked by the red breakpoint is the instruction which gets replaced with the bytes "eb 04". "eb 04" is a unconditional short jump of 4 bytes - which has the effect that the access check on the value 0x20 is ignored and the flow directly jumps to the preparation for calling the SAM-internal function _SampRetrieveUserPasswords. It seems this function is populating the attributes of the requested object with the NTLM hashes. By skimming over the disassembly (and by API the general API layout) I assume the register edi holds a handle to the UserObject, which whats to access the user's passwords. So what is referenced at edi+0xC? Whatever it is - if this byte's value is not 0x20 the call of _SampRetrieveUserPasswords is skipped. Since ULONG is 4 Bytes and SAM_DB_OBJECT_TYPE is an enum, which is an int and therefore also 4 Bytes 0xC means edi+0xC is accessing the ACCESS_MASK value - and since we are on x86 it's least significant byte. 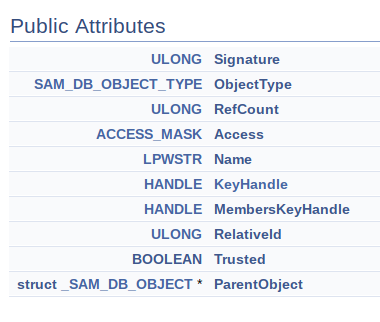 Lastly, by having a look at the SAMR documentation of the ACCESS_MASK, we can see: If the LSB of ACCESS_MASK is 0x20 the user accessing the object has the USER_WRITE_ACCOUNT permission, which translates to "Specifies the ability to write attributes related to the administration of the user object." to retrieve UserInternal1Information - which results, internally in samsrv.dll, in a call to SampQueryInformationUserInternal(), which we just patched. Just a additional note: You see the "case 0x12"in the disassembly above? SampQueryInformationUserInternal() is handling multiple internal buffers, and 0x12 stands for, as you can see here, for UserInternal1Information. SampQueryInformationUserInternal is just build as a huge switch-case-statement to handle the different types of requestable internal information buffers. IDA recognizes that switch-case-statement greatly! 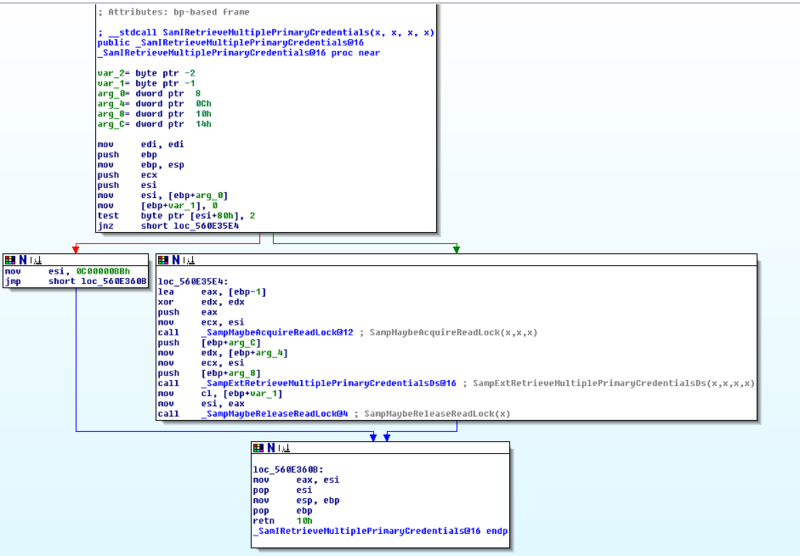 After we understood the technique used by mimikatz for /patch, what happens when we call lsadump::lsa /inject? Inject essentially starts a thread in the context of lsass.exe (SamSs-Service) and dumps the requested credentials from within this thread. run the thread and exploit! what is at $esi+0x80? $esi is, following the disassembly, the UserObject which requests the credentials. I did not found any documentation which explains this memory location? At least the second bit $esi+0x80 has to be set so that SampExtRetrieveMultiplePrimaryCredentials() is called. So we can assume this is the place where the granted access rights of the passed user object are checked. I do not see any obvious reason why this code can't be patched, to extend the /patch command to retrieve Kerberos and WDigest hashes? Any idea? Anyhow, hopefully this post explains some things (or does at least rise some more good questions ;)) and did reach the right level between highlevel overview and deepdive. Personally I learned a lot of the inner workings of mimikatz and Windows by digging around the disassembly of samsrv.dll and the source code of mimikatz! As always: Feedback is very welcome!